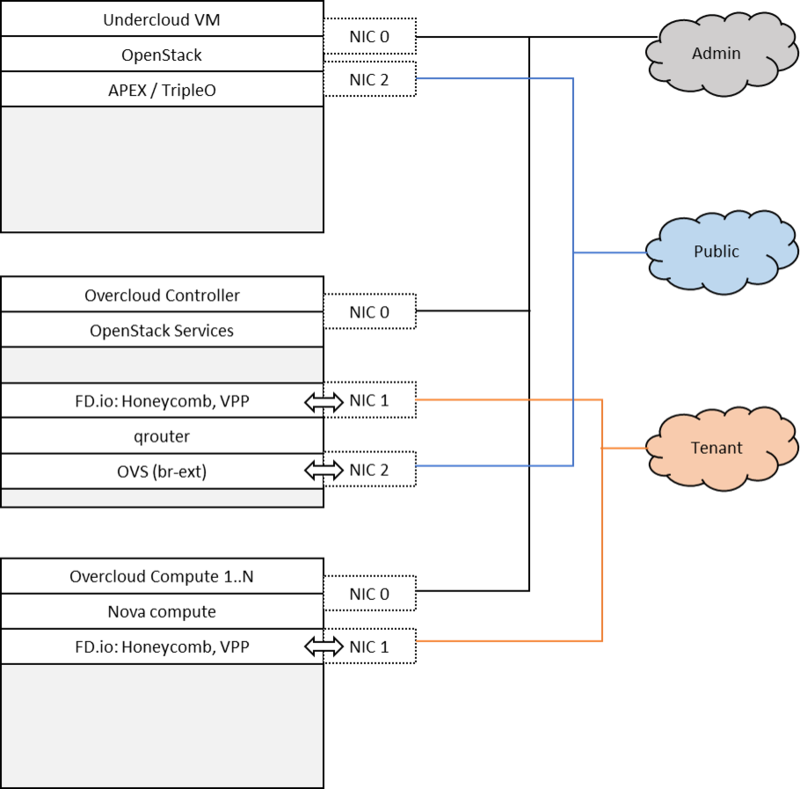 Scenario: “OpenStack - FD.io” (os-nosdn-fdio-noha) is a scenario developed as part of the FastDataStacks OPNFV project. NFV and virtualized high performance applications, such as video processing, require a “fast data stack” solution that provides both carrier grade forwarding performance, scalability and open extensibility. A key component of any NFV solution is the virtual forwarder, which needs to be a feature rich, high performance, highly scalable virtual switch-router. It needs to leverage hardware accelerators when available and run in user space. In addition, it should be modular and easily extensible. The Vector Packet Processor (VPP) supplied by the FD.io project meets these needs, in that it offers a highly scalable, high performance and easily extensible software forwarder that entirely runs in user space. The “Openstack - FD.io/VPP” scenario provides the capability to realize a set of use-cases relevant to the deployment of NFV nodes instantiated by means of an Openstack orchestration system on FD.io/VPP enabled compute nodes. Tenant networking leverages FD.io/VPP. Open VSwitch (OVS) is used for all other connectivity, in particular the connectivity to public networking / the Internet (i.e. br-ext) is performed via OVS as in any standard OpenStack deployment. Neutron ML2 plugin is configured to use networking-vpp, the ML2-VPP networking mechanism driver. Networking-vpp also provides the VPP management agent used to setup and manage layer 2 networking for the scenario. Tenant networking can either leverage VLANs or plain interfaces. Layer 3 connectivity for a tenant network is provided centrally via qrouter on the control node. As in a standard OpenStack deployment, the Layer3 agent configures the qrouter and associated rulesets for security (security groups) and NAT (floating IPs). Public IP network connectivity for a tenant network is provided by interconnecting the VPP-based bridge domain representing the tenant network to qrouter using a tap interface. The os-nosdn-fdio-noha scenario combines components from two key open source projects: OpenStack and Fast Data (FD.io). In order to make Fast Data (FD.io) networking available to this scenario, an ML2 mechanism driver and a light-weight control plane agent for VPP forwarder has been created. For details see also https://github.com/openstack/networking-vpp. Networking-vpp provides a Neutron ML2 mechanism driver to bring the advantages of VPP to OpenStack deployments.It uses an etcd cluster on the control node to keep track of the compute nodes, agent state and port bindings/unbindings. It’s been written to be as simple and readable as possible, which means it’s naive; the aim was not to write the most efficient mechanism driver ever from right out of the gate, but to write something simple and understandable and see how well it works and what needs to be changed. As a general rule, everything was implemented in the simplest way, for two reasons: one is that one sees working results the quickes, and the other is that it’s much easier to replace a simple system with a more complex one than it is to change a complex one. The current design will change, but the one that’s there at the moment is small and easy to read, even if it makes you pull faces when you read it. To enable the “os-nosdn-fdio-noha” scenario check the appropriate settings in the APEX configuration files. Those are typically found in /etc/opnfv-apex.